One of my coworkers has been in India for the past 5 weeks, teaching some procedures to our team members in Bangalore. It just so happens that the day he returns to work is also his birthday! Considering that this was a welcome back cake AND a birthday cake, I knew I needed to make something special. 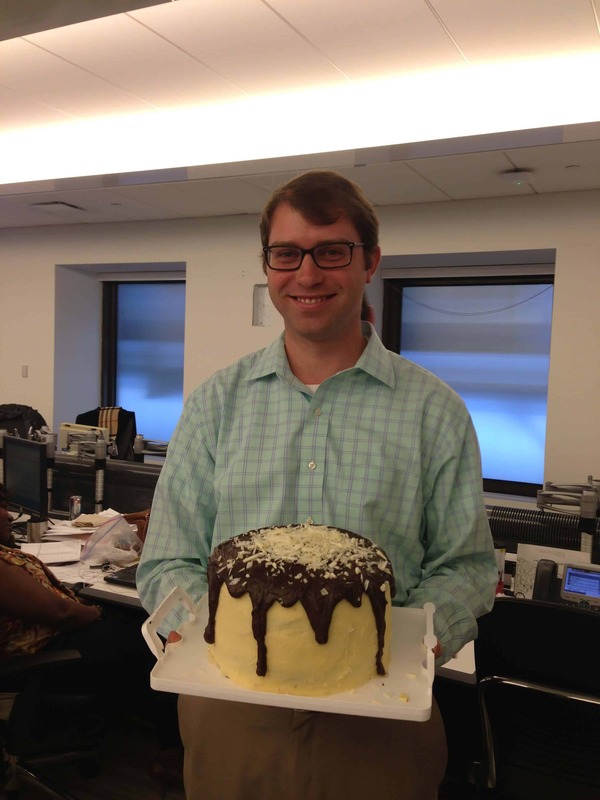 Patrick is a man of simple tastes, and requested a plain chocolate or vanilla cake. 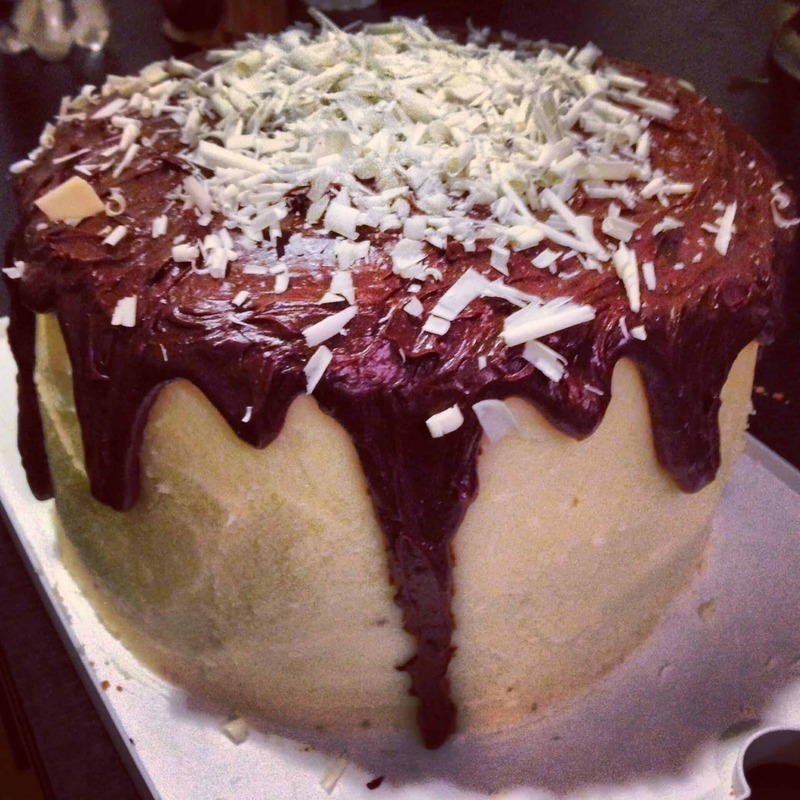 Of course, I wanted to do a little more than that….so I decided to make this chocolate ombre cake. 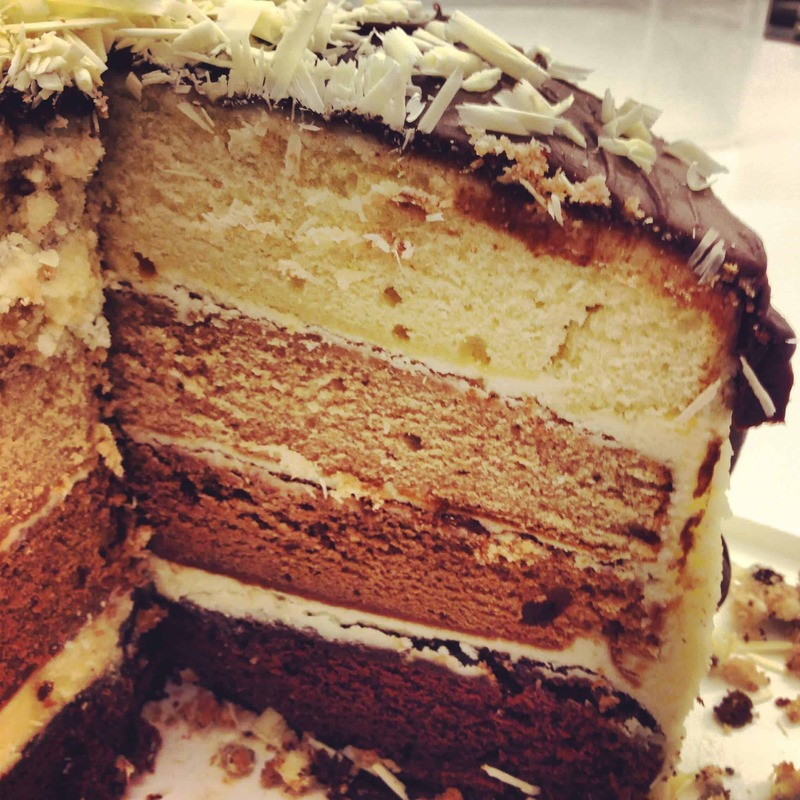 It’s base layer is rich and fudgy, which is followed by chocolate vanilla layers that fade into a light, vanilla layer. I covered each layer with a thick slather of vanilla buttercream, and then drizzled a decadent chocolate ganache over the entire thing. 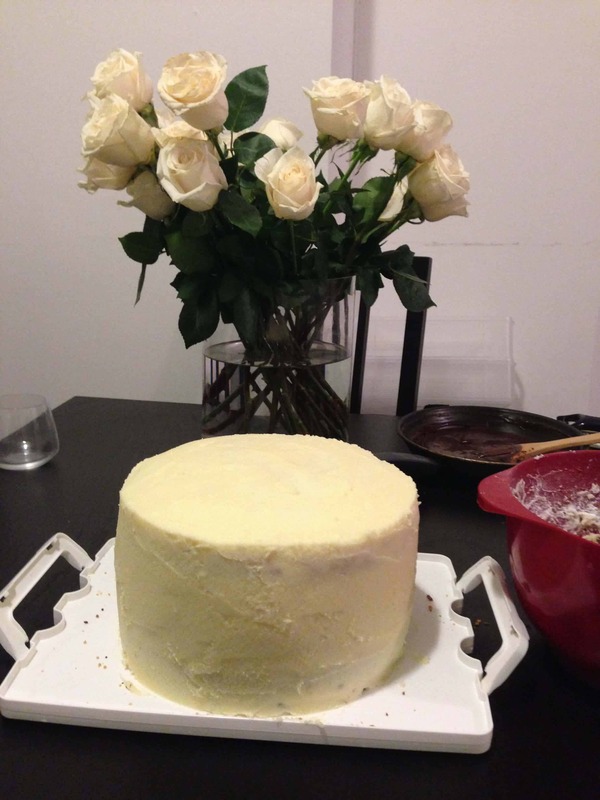 And as a final touch, I added some white chocolate shavings to the top. Preheat the oven to 350 degrees. Prepare the fudgy cake base first. Sift together the flour, baking soda and salt. Set aside. In a large bowl, beat the butter and brown sugar, until well mixed. Add eggs one at a time. Beat in the vanilla and melted chocolate squares. Add the sour cream and then the dry ingredients to the butter mixture, until well blended. Stir in hot coffee. Bake in a greased 9 inch cake pan for 35 minutes. Let this layer cool fully, and continue baking other layers. For the chocolate vanilla layers, cream together butter and shortening until light and fluffy with an electric mixer. Slowly add sugar one cup at a time, making sure to fully incorporate each cup before adding another. Add eggs one at a time, making sure to fully incorporate each egg before adding another. Sift together flour, baking powder, and salt. Add to butter and shortening mixture alternately with buttermilk, beginning and ending with dry ingredients. Add vanilla extract. Beat cake batter on high-speed for about 5 seconds to fully incorporate all ingredients. Stop mixer and scrape down sides and bottom of bowl, making sure to have all ingredients mixed well. Evenly distribute cake batter between three bowls, and stir 2/3 cup of cocoa into one, and the remaining third of a cup of cocoa into the other, leaving one bowl without any cocoa. Pour each bowl into a greased, lined 9 inch baking dish, and bake for 25-30 minutes (or until a toothpick or cake tester inserted in the center comes out clean). Remove and allow to cool slightly in cake pans for about 5 minutes, then cool completely on a wire rack. As the layers cool, prepare the ganache. Place the chocolate into a medium bowl. Heat the cream in a small sauce pan over medium heat. Bring just to a boil, watching very carefully because if it boils for a few seconds, it will boil out of the pot. When the cream has come to a boil, pour over the chopped chocolate, and whisk until smooth. 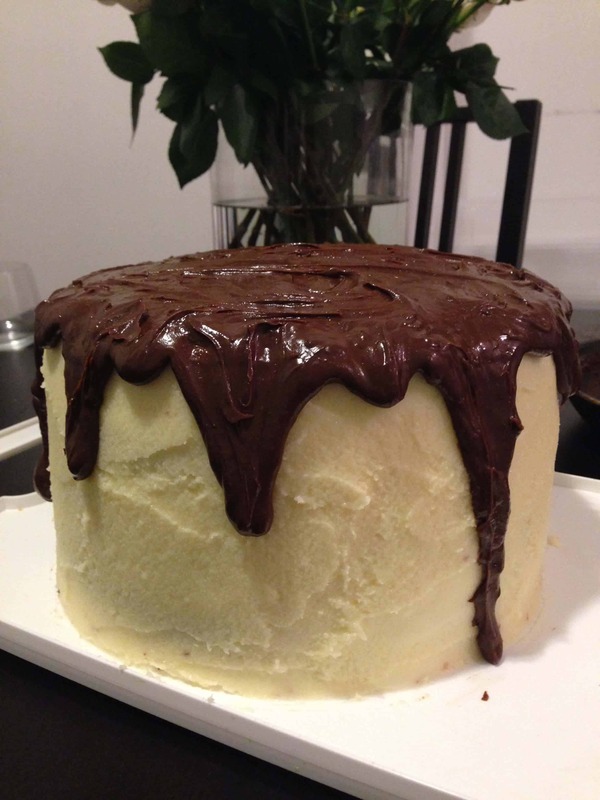 Allow the ganache to cool slightly before pouring over the cake. Start at the center of the cake and work out. As the ganache and cake layers cool, prepare the buttercream. Whip the butter at a medium speed, until light and fluffy. Gradually add in the powdered sugar. Add the vanilla, and continue to beat until fully incorporated. Add in cream, until desired consistency is achieved. 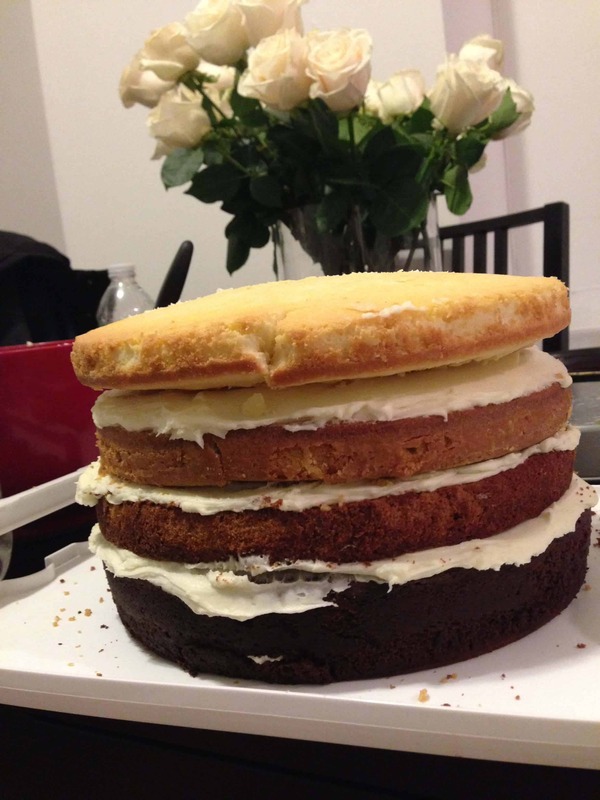 To assemble the cake, place the fudge layer at the base. Frost with a thick layer of buttercream. Repeat with fading layers. Once all layers are stacked and frosted, apply a crumb coat, and refrigerate for 15 minutes. 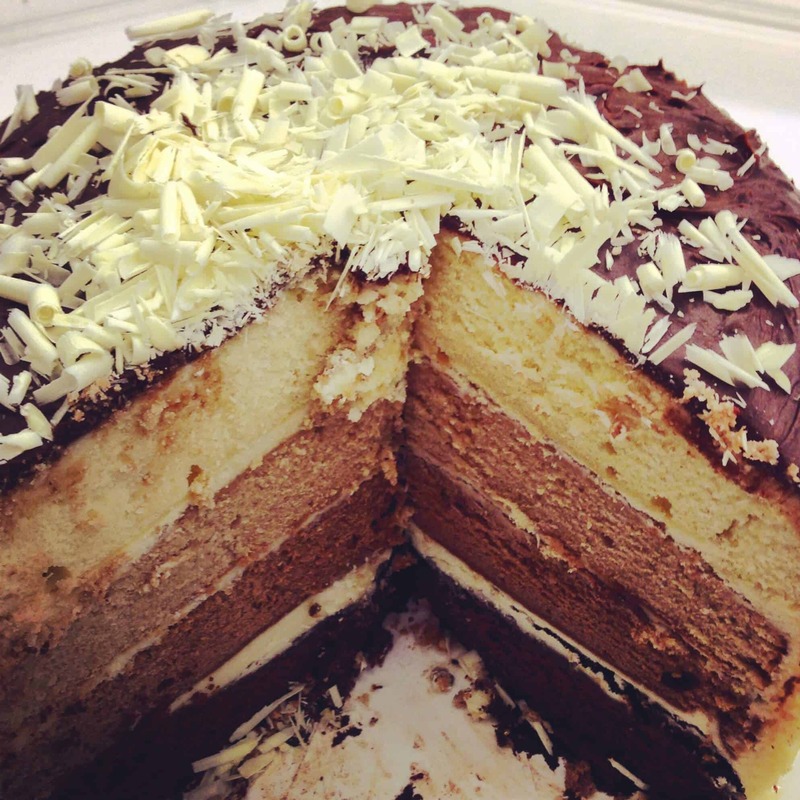 Once the crumb coat has set, apply another thick layer of frosting to the entire cake. Place in the fridge for another 10 minutes to set the frosting. 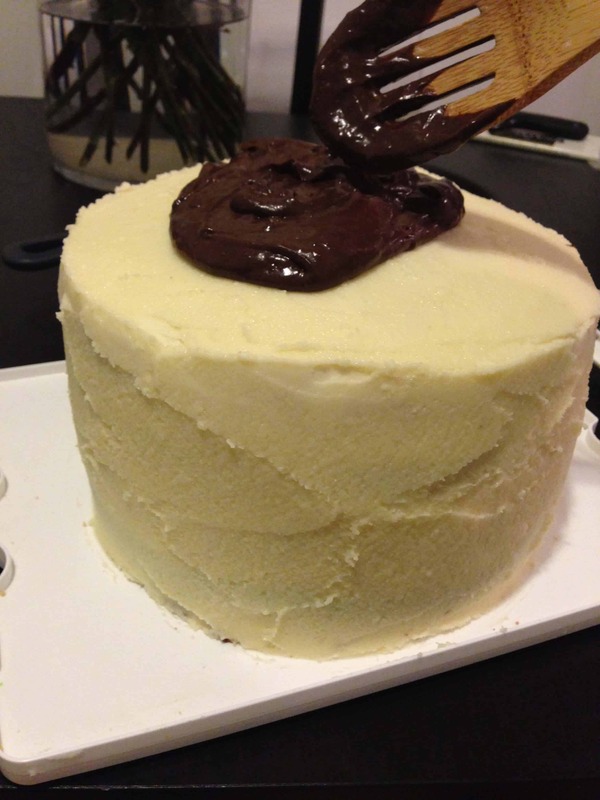 Once the frosting is set, pour the thickened ganache onto the center of the cake, and gently spread it toward the edges. Let some of the ganache spill down the sides. Finish with a garnish of white chocolate shavings. Looks AMAZING! I love how the colors go from darker to light, from bottom up! Happy baking and Happy Valentine’s Day!